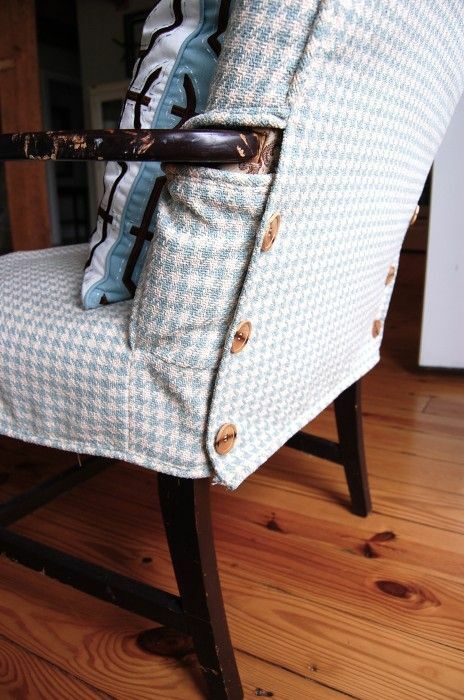 Slipcovers are a great option for updating old chairs with new life. If you’re tired of your old pattern, or the fabric on your chair is worn out or stained, but you’re not ready to buy a new chair or fully reupholster, slipcovers offer an easy, inexpensive option to update your furniture with little effort. Slipcovers are a good choice for chairs that are in good condition, but need a change of fabric. A slipcover won’t change a chair that needs to be restuffed or has structural issues. Slipcovers are typically inexpensive to make or buy, and are easy to take off and replace. They can be washed, so you can keep chairs clean for guests, and removing a slipcover is much easier than cleaning upholstery on the chair. Slipcovers can protect underlying fabric from spills, pets, children, or dirt as well. When you update your chair with a slipcover, you can choose a fabric in practically any color, pattern, and fabric type, and you may have more flexibility with a slipcover than you would with direct upholstery. You can even choose multiple slipcovers so you can change out your decor each season. Durability. You want your fabric to hold up to traffic and washing. Heavy cotton, duck, canvas, or twill are firm and durable. If you expect heavy daily use, from kids and pets with frequent washing, choose a heavy weight fabric. If your slipcover will sit near a sun filled window, look for a fabric that offers colorfastness. Typically, a light or neutral color will fade less quickly than dark or bright ones. Cleanability. Look for a dark color or patterned fabric if you want to hide stains, such as wool or linen. Cotton, denim, and canvas are machine washable, but fabrics like silk may need to be dry cleaned. Looks. Consider patterns and colors that complement your room. Don’t immediately rule out white, as it can be easily removed and bleached. Consider choosing different slipcovers for different seasons, such as white for summer, tan for fall, deep blue for winter, and green for spring. Adaptability and weight. A thin slipcover made of a blend of cotton and spandex, microsuede, polyester will stretch to fit your chair closely without wrinkles, ties, or pleats with a form fitting finish. But this may not look good on your chair and won’t be as durable as thicker fabrics. Look for medium weight fabric, avoiding heavy fabrics such as chenille or velvet that may not conform to your chair’s shape very well. Weave. A tightly woven fabric is best, so the underlying fabric won’t show through. Pull on both sides of the fabric to see how much the fibers move and separate. Texture. Look for a fabric that will resist wrinkling, such as twill or denim, corduroy. A softer fabric can be more comfortable. Keep in mind that shiny fabrics may not lay well. Treatments. Consider fabrics with treatments for stain resistance, flame resistance, and more. You may prefer to have them for protection, or prefer fabrics without them because they may have offgassing smells. Width. Make sure the fabric you want is wide enough for your project. Once you’ve found fabric you like for your slipcover project, consider washing it before making a final decision. After washing, you’ll see how fabric will wash, wrinkle, and shrink. You can find out how it feels after it’s washed, and see if it pills, fades, or puckers. If you like what you see, you can order enough for your full project. Catch up on the latest trends in Home Decor! Receive more inspirational articles, DIY decor tips, and get the best deals on fabric. Just enter your email address below. 100% Privacy. We don't spam. Your email is safe.